These are the moments founding director of Wavelength Music in Toronto, Jonny Dovercourt aka Jonathan Bunce lives for when putting on events. Between Wavelength’s two annual festivals, a monthly year-round concert series in various venues, workshops and outreach events, Wavelength is doing a lot for the music community of Toronto. WL even launched an inaugural Artist Incubator series in 2013 that helps emerging artists. “Our Incubator has been a bit of an experiment in terms of us being more than just show promoters, and taking our curatorial approach into artist development – we help out some of the bands we’re most excited about behind the scenes with mentorship and connecting them to opportunities – and we also feature them prominently on some of our bigger events.” What Jonny is most excited about right now is Wavelength’s NYE party tonight at the Markham House City Building Lab, celebrating 16 years of Wavelength. 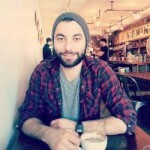 I had a chance to chat with Jonny Dovercourt about Wavelength’s history along with a few of Jonny’s favourite Toronto spots. Where did the idea of Wavelength come from? The idea for Wavelength came from the collective dreaming and scheming of a group of DIY independent musicians who wanted to find a way to generate more excitement around Toronto’s underground music scene. How has your M.O. changed from the time you started Wavelength until now? Surprisingly, it has changed very little. Though Wavelength has gone through several shifts in evolution in terms of the format of our series and structure of our organization, our aim is still the same as when we started: to champion the new, the emerging, the original, the exciting, and the local, to better showcase the creative diversity of Toronto, and to create a forum for networking and community-building among musicians, artists and audiences. Biggest challenge to date with Wavelength? The number of artists and audience members who credit Wavelength with being their introduction and entry point to the Toronto independent music community. 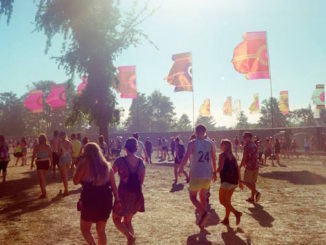 What do you look for when acquiring bands for your festivals and your monthly concert series? Fresh sounds & approachable approaches – the warmth of the familiar combined with the shock of the new. You’re also in a local post-punk, avant rock band called Several Futures. Tell us about it! I was a musician before I became a presenter, having played in bands since my teenage years, and luckily I haven’t lost the passion for playing and creating new music. Several Futures started almost two years ago as a collaboration with two long-time friends and bandmates: Matt Nish-Lapidus (guitar/vocals) and Evan Davies (drums); I’m on bass/vocals. SF doesn’t really sound like a band from today, our influences are definitely coming from seminal ’80s and ’90s bands like Sonic Youth, Mission of Burma, Slint, and Drive Like Jehu – but then again, everything’s back in fashion now, isn’t it? We are currently finishing our debut full-length album for release in February. What’s your favourite thing about Toronto? It’s a big city that feels like a small town, and you don’t need to own a car. Favourite Toronto spot to eat? Depends on my mood. Lalibela for Ethiopian, Ho Su for Japanese/Korean, Tacos el Asador for Latin, Hello Darling for brunch. What’s in store for Wavelength in 2016? Our big tent-pole events are Wavelength Music Festival 16 (Feb. 11-14) and the second edition of Camp Wavelength in August – as well as bigger monthly shows giving you a more concentrated dose of Wavelength goodness! Tonight’s NYE Wavelength Music show will be celebrating 16 years for Wavelength which is amazing! Is this the first NYE show? I hope so, but only time will tell! Have the performers all been a part of previous Wavelength Music shows? Yes indeed. Maylee Todd has been a regular on the WL scene since 2008 or so, and Man Made Hill, MATROX, Delta Will and The Holy Gasp first played in 2012, 2013, 2014 and 2015, respectively. With so many options for NYE, tell us why people should attend the Wavelength Music NYE show? It’s going to be more like a well-curated house party than a regular concert or club show. There’s only 100 tickets for sale, so it will be super intimate. All the bands are super diverse and fun. Plus, Maylee Todd is going to be doing her aerobic-themed Sweatshop Hop, which will get you started on those New Year’s Resolutions good and early!! And MATROX are likely the city’s only dance band made up of robots. 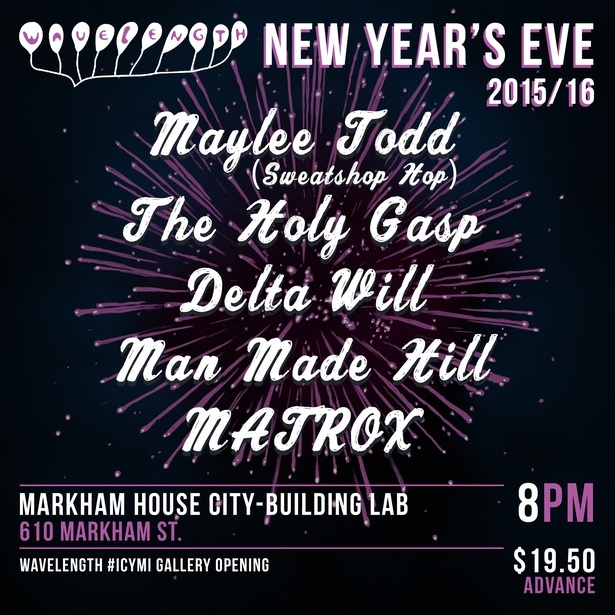 Why did you choose the Markham House City Building Lab for this show? We were approached by the fine folks who run this new community hub space in Mirvish Village about presenting some programming in their space, and the timing just worked out perfectly to do our New Year’s Eve show there. 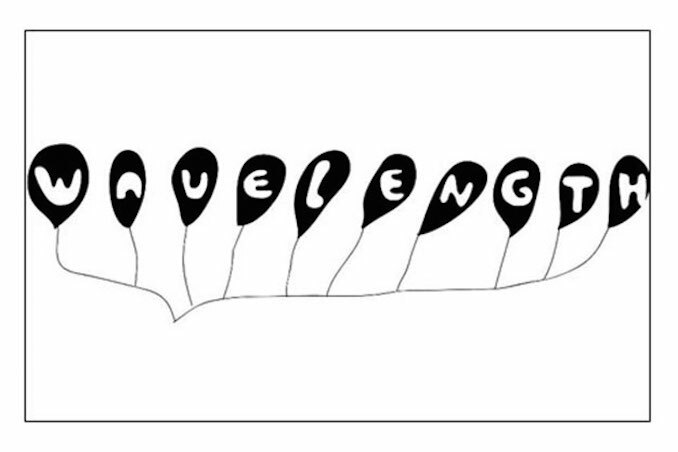 In January, we’re going to be opening a gallery exhibit at Markham House called “Wavelength #ICYMI,” a remount of our Pop-Up Gallery show from last winter, featuring archival Wavelength show posters, concert photos, and festival artwork, which will lead up to our Sweet 16 anniversary fest in mid-February. Any surprises planned that you can share?